Holy Water Sprinkler, 4" long, 5/8" diameter. This Holy Water Pocket Sprinkler has a classic shape and beautiful brass finish. The cylindrical design is easy to hold and use. 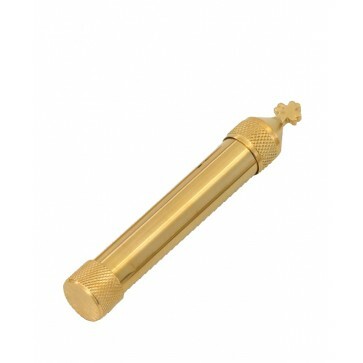 The sprinkler is sized perfectly for holding in a pocket, making it ideal for use at a home church or while traveling. The sprinkler has a simple cross design on the top and textured end caps for a small amount of decoration. It makes the perfect gift for a newly ordained clergy member and can be used for many Blessed Events. A vinyl case and gift box is included.